Turkey and Cheese Applewiches | Keep It Up, David! 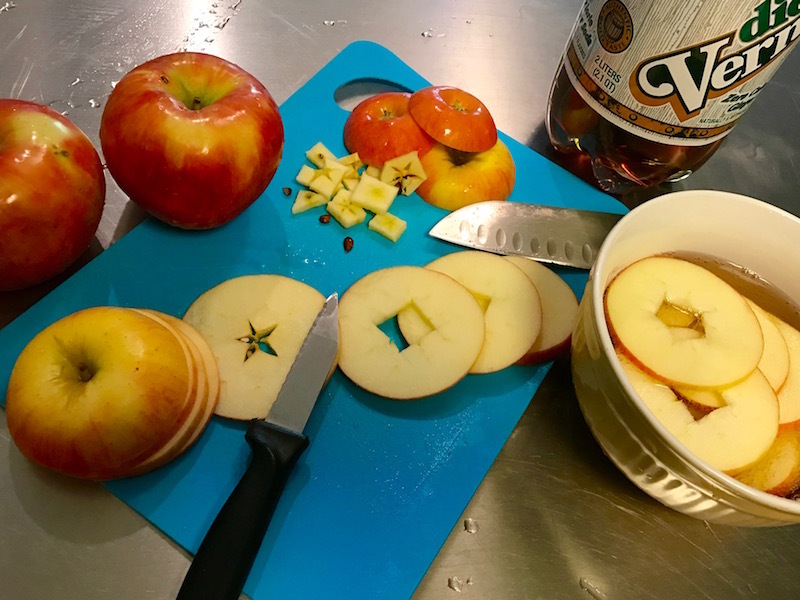 Start by slicing apples into pretty thin pieces. Use whatever apples you like best. 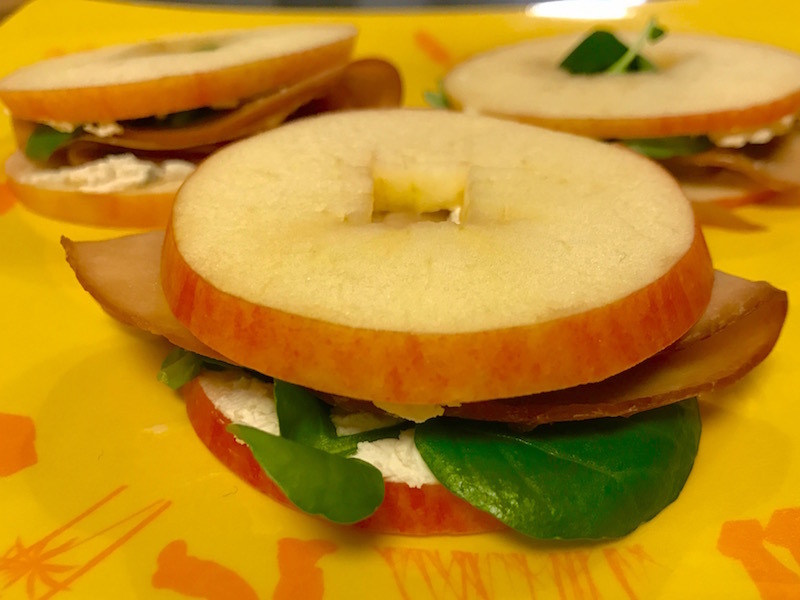 I used one Honeycrisp, and two Pinata apples. You’ll have to cut out the core in the center of each slice, which I did with a little paring knife (a tiny circular cookie cutter would work great too, if you have it!). 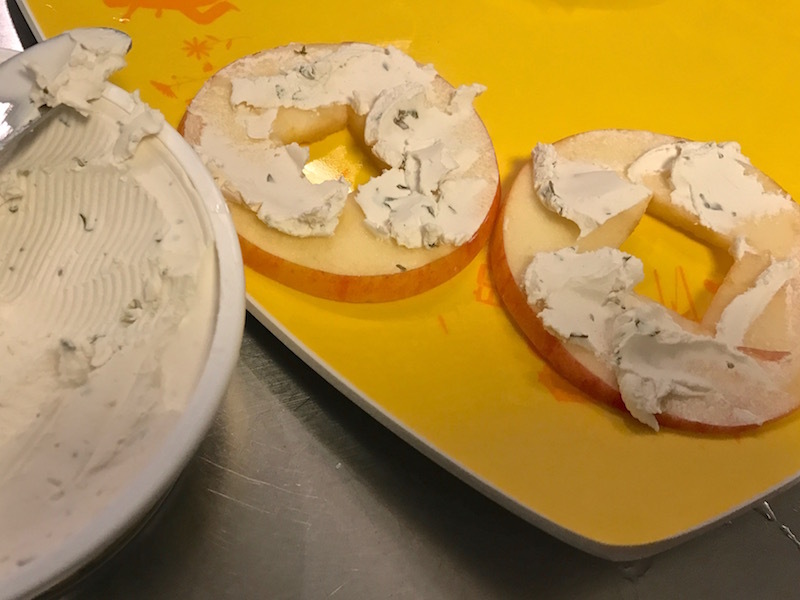 You want to immediately hit the apple slices with some acid so they don’t turn brown. Lemon or lime juice works, but I dunked them in a bowl of diet ginger ale, which worked like a charm. (I used Diet Vernors, because that’s a Michigan brand, and I’m a Michigan boy). Citric acid is the ingredient in soda that prevents the browning, and it can be found in lots of brands, including Sprite, Diet Coke, Fanta, Mountain Dew… just read the label. You only need to soak them for a couple minutes, and the apples won’t absorb any flavor. 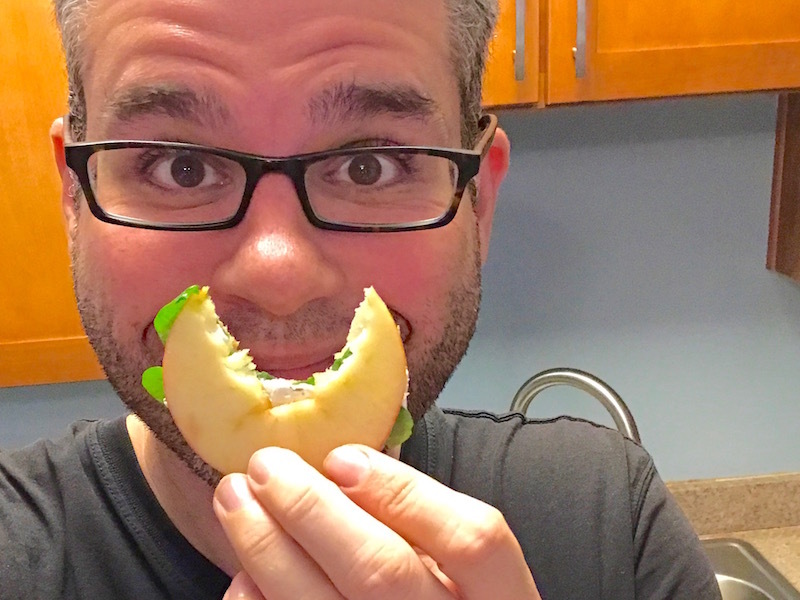 I put my leftover apple slices into the fridge and the next day, a solid 24 hours later, they still looked freshly cut, without a speck of brown on them. 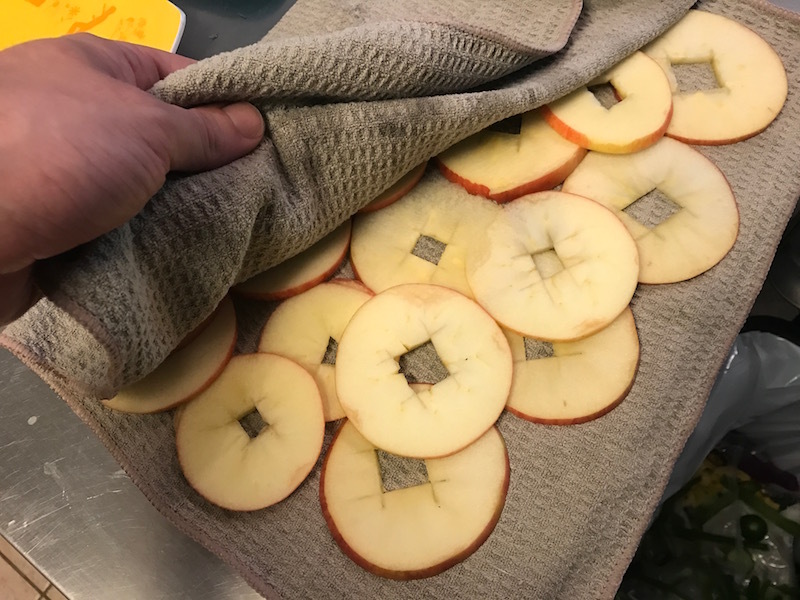 After soaking for a wee bit, I blotted the apple slices dry between the folds of a towel. I was planning on taking these to a little get-together where there’d be some vegans in attendance, so I chose ingredients that would make these vegan, although you certainly don’t have to. Instead of regular turkey, I chose Hickory-Smoked Tofurky Deli Slices. I like meat alternatives – I’ve never fooled into thinking I’m eating meat, but I don’t care. The flavor and texture is good, and they’re still a good source of protein. I wanted a spreadable cheese, which could, in addition to adding flavor, add like a binder to hold the other ingredients together. 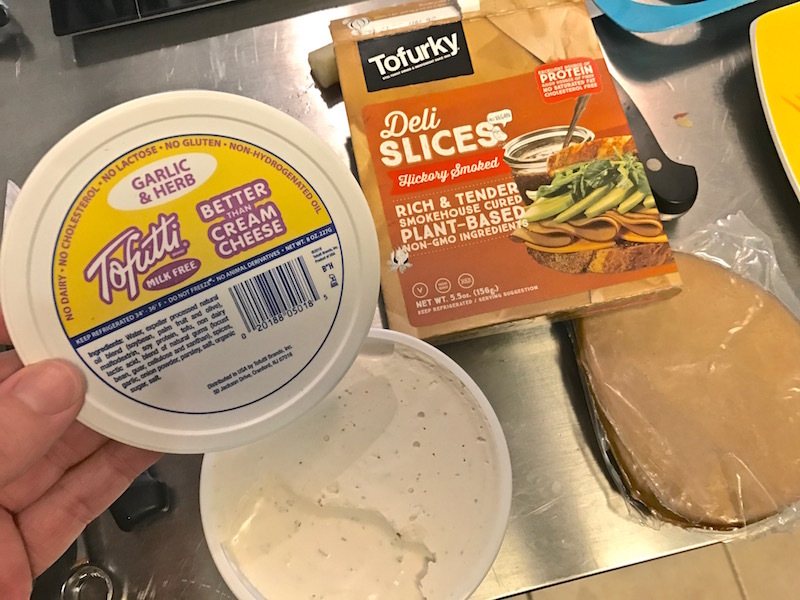 Brie or regular cream cheese would work great, but I used Garlic & Herb Tofutti, which is a vegan cream cheese alternative. The third ingredient, watercress, is a peppery type of salad green. I figured with so few ingredients, each of them should really bring something bold to the table, and watercress is about as bold as salad greens get. 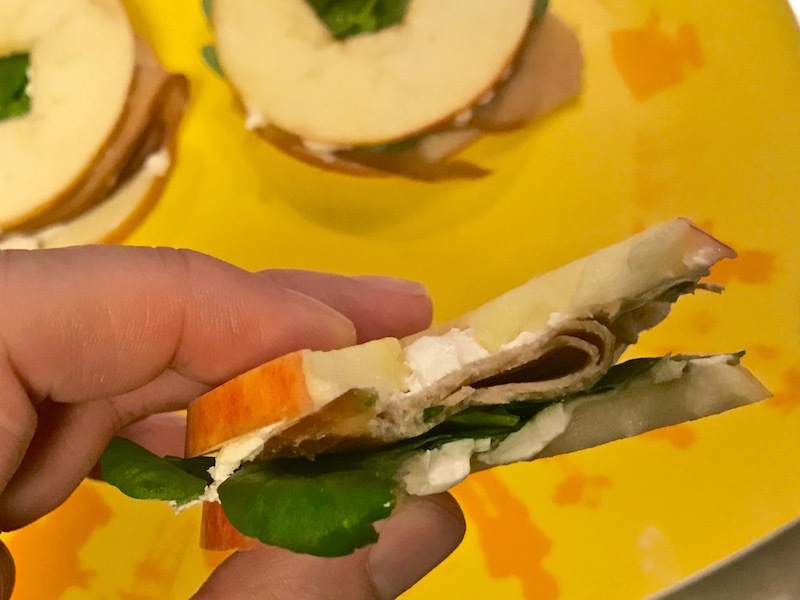 Assembling the sandwiches is easy. Spread 1 teaspoon of the Tofutti on each apple slice. Top one with a few leaves of watercress and a slice of Tofurky. Then top with the other apple slice. See? Easy peasy! They’re fantastic finger food, perfect for a party or to eat on the go. And each applewich is only 67 calories! They have 8 grams of carbs, 4 grams of protein, and a little over 2 grams of fat. And there’s lots of ways you can switch up the fillings. I think ham and Swiss would taste good, or turkey with sharp cheddar cheese, or you could go sweeter and do peanut butter and raisins. Another friend at this get-together is gluten-free, and Tofurky is not gluten-free, so I came up with a cucumber, watercress, and Tofutti version for him. 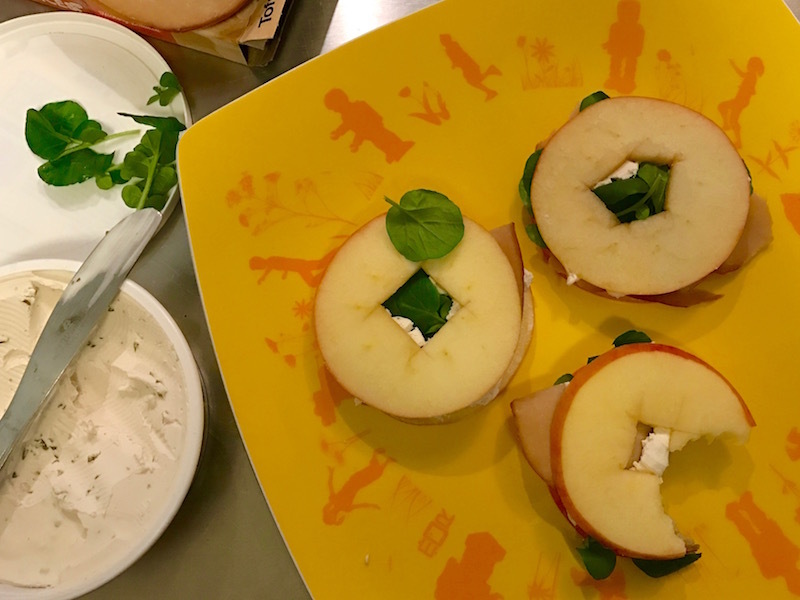 Whatever the filling, applewiches are sure to bring a smile to your face! Check out all my healthy recipes on my Recipes page! This entry was posted on Monday, February 20th, 2017 at 12:09 am and is filed under Uncategorized. You can follow any responses to this entry through the RSS 2.0 feed. You can leave a response, or trackback from your own site. Yum! We have turkey, cheddar, honey crisp apples, and honey mustard in the fridge. I’ll be making them tomorrow! Thanks for a great idea.